Shape Yourself: My 6-Step Diet and Fitness Plan to Achieve the Best Shape of Your Life proves that Martina Navratilova is a legend as she approaches everything with enthusiasm, determination and humor. Navratilova sprinkles humorous asides from her famous and fabulous friends into commonsense (ever notice how uncommon that trait has become?) advice on dieting and exercise. No kumquat diets here,folks,so if you’re looking for gimmicks, look for another book. If, however, you want reasonable advice on making the best of your body, this is the book for you. Making the point that those other countries that focus on whole grains, fruits and veggies (minus pesticides) and some lean protein have fewer incidences of obesity, she also notes that in the United States obsession with “more is better” results in over-exercising, which can be almost as detrimental to your health as not exercising at all. 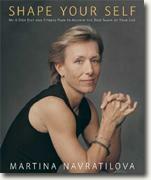 To illustrate her points Navratilova includes sample menus, recipes and exercise descriptions and pictures to help out the exercise and nutritionally challenged among us. Shape Yourself is one of the best diet and fitness books I’ve ever read. If you or someone you know is struggling with weight issues, go get this book.